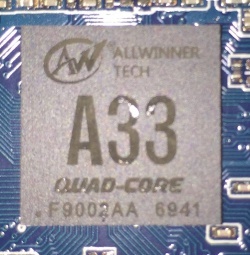 Allwinner A33 (sun8i) SoC features a Quad-Core Cortex-A7 ARM CPU, and a Mali400 MP2 GPU from ARM. It is a Quad-Core pin-to-pin-compatible version of A23 (which in turn is a lower power, cut-down, not-pin-compatible version of the A20). It's now also called R16, targeted on miscellaneous IoT devices, such as Nintendo NES Classic Edition gaming console. There is no support for the A33 in the linux-sunxi 3.4 kernel and in u-boot-sunxi. Support in mainline u-boot and in the mainline kernel is work in progress. A33 will officially support Android 4.4 and above from AllWinner, so no official multi-OS support like some other higher-end AllWinner SoCs. Below are links on pan baidu for the original A33 SDK. You will need to install the Baidu Yun Guanjia download manager in order to download the files. I was able to succesfully build the SDK on Ubuntu 12.04 (after installing dependencies and java) and burn it to an SDCard using PhoenixCard and have it run on an A33 tablet. You may need to replace the y3 sys_config.fex with an appropriate fex for your A33 tablet. The build image works on several of my A33 tablets, but gets stuck on the loading screen on some others. This page was last modified on 1 June 2018, at 10:34. This page has been accessed 93,931 times.